Woohoo!!! What an awesome race. No team orders, no bull!. Just pure racing and some misfortune for Lewis Hamilton saw the Iceman - Kimi Raikkonen win his maiden World Championship. Some really level-headed racing by Felipe Massa and Kimi ensured that no one else overtook them and got Kimi the championship by just 1 point!. Its so fun/satisfying/interesting/awesome/cool/beautiful/gratifying to see that people do not like a taste of their own medicine when stuffed down their throat and get all hot under the collar and lose their cool. Nice one!! (Don't know why this keeps coming in small letters - unable to change, hence leaving as is!). 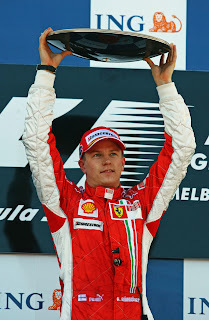 I'm happy that Ferrari won the driver's championship and construction. But was a little sad when they made Massa slow down to make Kimi win. The usual Ferrari stuff. Massa was really driving well.